The Hon. Daniela Kahaulelio’s reminiscences of Lahaina, 1898. The Judge of the Shade of the Breadruit Trees of Lele. New street names announcement in English, 1856. Hawaii Pae Aina. Iulai, 12, 1844. Monsieur le Ministre,—Ke hai aku nei au ia oe me ka mahalo, ua loaa ia’u na palapala Oihana e pono ai au ke hooakaka aku, i na Luna o na Aina e i launa pu me Farani. I ka ae ana aku o ke Aupuni o ka Moi Karisiano loa e hoomalu maopopo aku e like me ke koi ana mai o Lawelua ke ‘Lii, o Ea, (Wallis) mokupuni, a o Pileko ke ‘Lii o Foutouna Mokupuni. Eia hoi kekahi, ma ke kuikahi i hanaia mawaena o ke ‘Lii Charte, a me ke ‘Lii o Gambier Mokupuni, ua paa loa ka hoomalu ana o Farani maluna o ia mau aina, aia no nae ka hooholoia e ke ‘Lii o ko Farani. E ae mai oe i kuu hoike ana ia oe, ka mahalo oiaio o kuu noho ana o kau kauwa hoolohe. Luna no ko na aina e.
Sandwich Islands, 12 July, 1844. Monsieur le Ministre,—I have the honor to inform you that i have received Official despatches that authorize me to announce to the representatives of Nations in alliance with France, that the Government of His Most Christian Majesty, has accorded in principle the protection demanded by Lavelua, King of the Wallis Islands, and by Pileto, King of the Island Foutouna, and further that by a convention concluded between the commandant of the Frigate Charte, and the King of the Gambier Islands, the protection of France has been equally established over that Archipelago, subject always to the ratification of His Majesty the King of the French. The Polynesian, New Series, Volume 1, Number 9, Page 2. July 20, 1844. 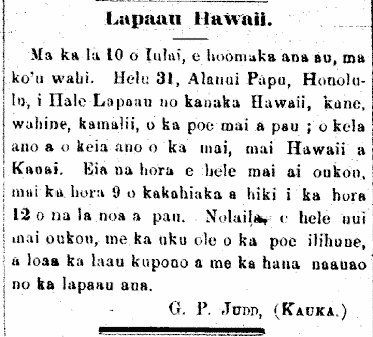 Kauka Judd opens a clinic for Hawaiians, 1871. On the 10th of July, I will commence at my place. Number 31, Fort Street, Honolulu, a Clinic for Hawaiian, men, women, children, everyone; with any illness, from Hawaii to Kauai. These are the hours for you all to come by, from 9 o’clock in the morning until 12 on weekdays [la noa]. Therefore, come all; there is no pay for the indigent, and you will get proper medicine with enlightened treatment. Ke Au Okoa, Buke VII, Helu 14, Aoao 2. Iulai 20, 1871.